Your Team Sportswear Ltd cannot accept returns on customised goods. Please see below for further details. To return items that are without printing or embroidery, you must contact Your Team Sportswear Ltd who will give you an returns authorisation number. Please return within 14 days where a full refund will be given providing the items are in original packaging with labels and are unworn. Your Team Sportswear Ltd will not accept returns after 14 days of you receiving the items. If you receive a product that you deem to be faulty please contact Your Team Sportswear giving details of the fault and we will issue a returns authorisation number. Your Team Sportswear Ltd are unable to accept returns on any products that have been personalised which include printing and embroidery. 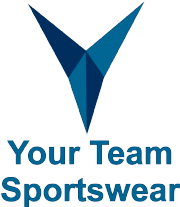 Your Team Sportswear Ltd will review cases where a product is faulty or damaged, this will include the garment or item alone and not include the customisation of the garments. Any issues with printing or embroidery that is different to what has been approved,or, a defect is present on the printing or embroidery. In these cases please contact your Your Team Sportswear Ltd sales member and they will aim to sort this is issue. If it is an issue that cannot be sorted by the customer then Your Team Sportswear Ltd will collect these goods and rectify this issue. Your Team Sportswear Ltd hold the right to amend the defected printing or embroidery, if this fails then Your Team Sportswear Ltd will replace the defected item. In rare cases where an item is no longer available Your Team Sportswear Ltd will offer an alternative product or refund this defected item via the payment method provided. Refund of shipping return cost is only applicable on faulty items and where agreed prior to the return of the item(s). Where Your Team Sportswear Ltd have asked for a product to be returned and it is then deemed to be faulty Your Team Sportswear Ltd shall cover the cost of the return postage up to a maximum of £8.00. If the return postage exceeds this price, please contact Your Team Sportswear Ltd directly before sending items back.